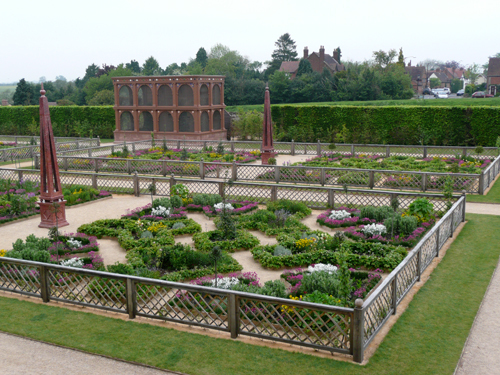 English Heritage has recently re-created one of the greatest gardens of the Elizabethan age in the grounds of Kenilworth Castle, in Warwickshire. 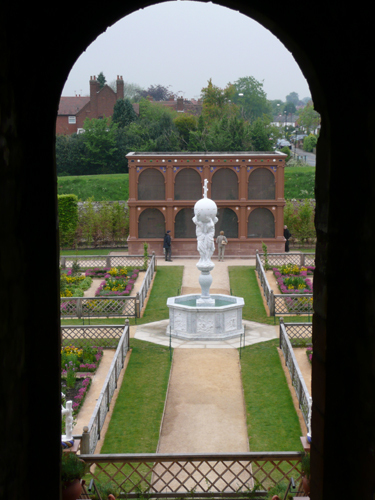 The original garden was built by Robert Dudley, Earl of Leicester, in honour of Queen Elizabeth’s nine-day visit to the castle in July 1575. 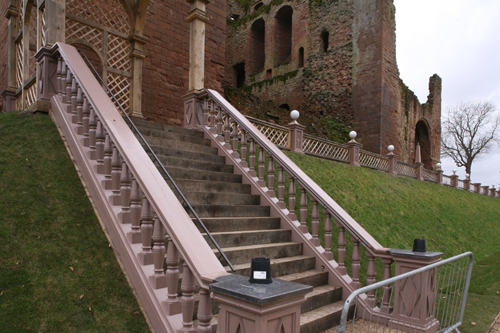 She had presented Kenilworth Castle to Dudley, her favourite, in the fifth year of her reign, and he had added to it and furnished it with many wonderful things. The garden was at the height of fashion and incorporated both Tudor and Renaissance elements, as well as Italianate features. 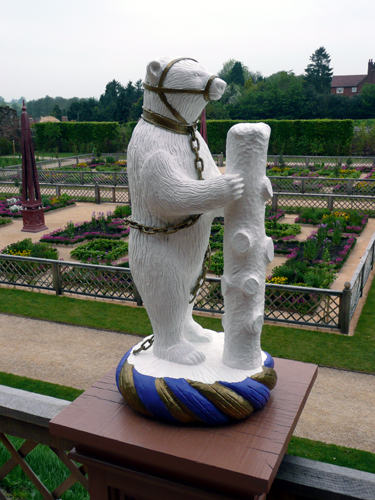 This was an unusual project for Papers and Paints, but not because it concerned an early formal garden, for we had already advised on the recreation of King William III’s Privy Garden and on Henry VIII’s beasts at Hampton Court Palace. It was unusual because it was a last-minute trouble-shooting project with which we had had no prior involvement. 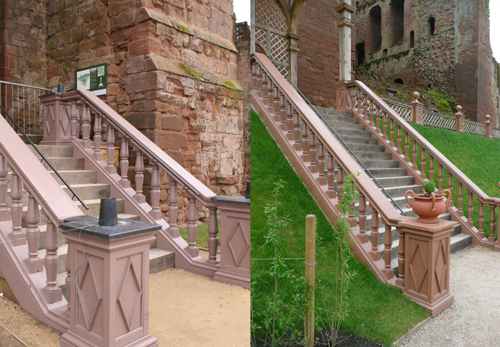 The architect had tried to match the colour of the Hollington Stone of the Castle for the painting of the green oak balustrades and the aviary, and had made a very good job of it. Unfortunately when the painted balustrade was juxtaposed with the grass of the terrace an unfortunate effect was created. I recognised that this was a phenomenon known as Complementary Contrast – where the redness of the balustrade was exaggerated by the green of the grass. The situation was almost as bad when seen against the new stone on the base of the aviary, although here it appeared more grey-blue. Many years experience of adjusting colours to suit clients’ tastes had made it clear that the dull yellow earth colour, known as yellow ochre, was called for. However, this was not purely a colour issue as the adjusted coating still had to answer all the technical needs required of it and not invalidate the manufacturer’s guarantee. To complicate matters the colour range of the German paint that had been chosen was very limited and there was no time to order a special colour from Germany. The impending opening of the garden meant that I had only one chance to resolve the matter. Fortunately one of the sixteen available colours was a light ochre and my solution was to apply a thin wash of this over the existing colour. The painting contractor was very enterprising, understood what was required and produced an excellent result, which can be seen in the “before and after” images above. The recreation has been based on a detailed description in a letter written by Robert Langham (sometimes Laneham), a mercer and minor court official, and on archaeological investigations by English Heritage and research by its garden historians. A combination of these resources led to the discovery of the base of the eight-sided fountain in the centre of the garden. There was sufficient information to enable a new one to be carved out of white marble. 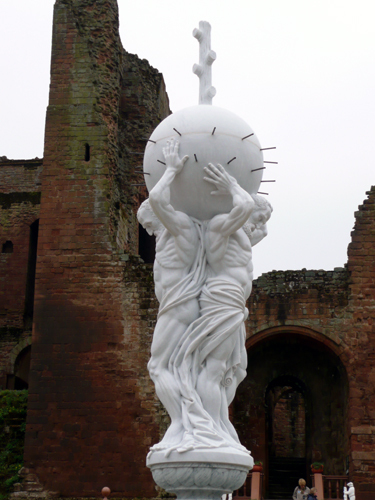 The base has been decorated with carvings that illustrate scenes from Ovid’s Metamorphoses and on a central pedestal are two male figures – called ‘Atlantes’ – holding a sphere surmounted by a ragged staff, which was Dudley’s heraldic emblem. 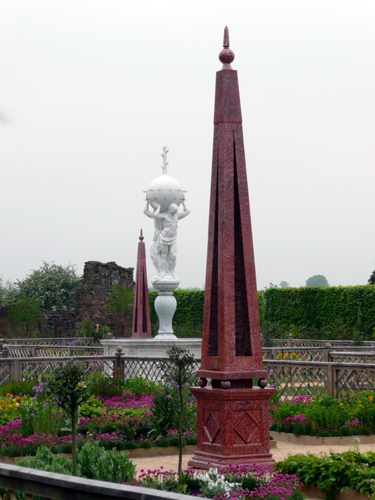 Langham described how the garden was split into four quarters, each containing porphyry obelisks and these have been recreated in painted wood. 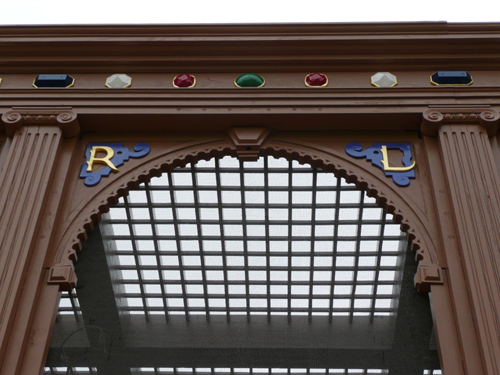 He described the aviary as being “beautified with great diamonds, emeralds, rubies and sapphires … and garnished with gold” and this has also been reconstructed (see below). He went on to describe how there was a terrace close to the wall of the Castle. On this there were more obelisks, great balls, and white heraldic beasts, all perched on posts. At each end of the terrace was a bower, smelling of sweet flowers and trees. Once again all these elements have been recreated. 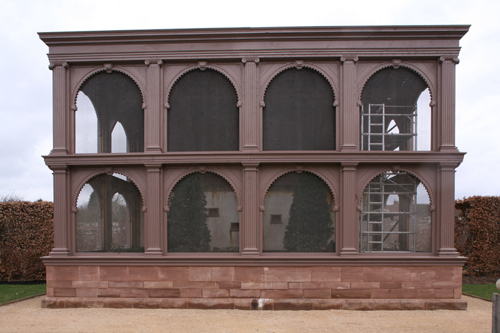 Within a very short time Papers and Paints was able to sort out a minor problem that could otherwise have marred the £2 million restoration.